Wow! I guess you could say that Connor McDavid of the Erie Otters has filthy mitts as well. This is McDavid's goal against the Sault Ste. Marie Greyhounds. The Otters are playing the Greyhounds in the OHL conference finals. Recently, I wrote Comparing BU’s Jack Eichel to Other College Hockey Greats for the Hockey Writers and apparently one of my comments in a post caught the eye of a CHL fan. 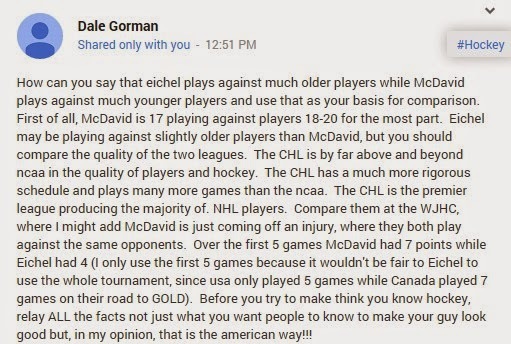 Since McDavid plays in the OHL and Eichel plays in college, it’s almost impossible to compare the two players’ stats. First, Eichel is playing against older players in college hockey. Second, McDavid is racking up points against younger players in the OHL. This is not a slam on either league. Both college and Major Juniors are good routes for development and both players are great talents. However, we can compare their WJHC numbers. In his first five games for team Canada, McDavid scored (2g-5a—7pts). On the flip side, in five games Eichel scored (1g-3a—4pts). For the sake of comparison, Dylan Larkin who scored (5g-2a—7pts) was the top player on team USA. Comparing Eichel to the other first round draft choices on the USA WJC team, Alex Tuch scored (1g-1a—2pts), Sonny Milano (2g-2a—4pts). Nevertheless, college hockey players are playing against older, stronger players in college hockey. The players in the CHL are playing against younger players, there's statistics to back this up. The disparity in size and ability between a 16 and 20-year-old is much different than that of a 21 and 25-year-old, he said. The fact remains, the CHL and the NCAA are both great routes for development. There's no debating this. The CHL is a great route to the NHL if you're a high draft pick. If you're a late bloomer, the NCAA route is probably better. First I want to be clear, I think fighting has a place in hockey. That being said, there's no reason for your star players to be fighting, in any level of hockey. Erie Otters forward Connor McDavid is probably going to be the first player taken in 2015 NHL Entry Draft, and he leave the ice fighting Bryson Cianfrone. To date, McDavid has some sick numbers scoring (18g-35a—51) pts in 18 games. So it begins... Team USA 2014 WJC defends the gold.